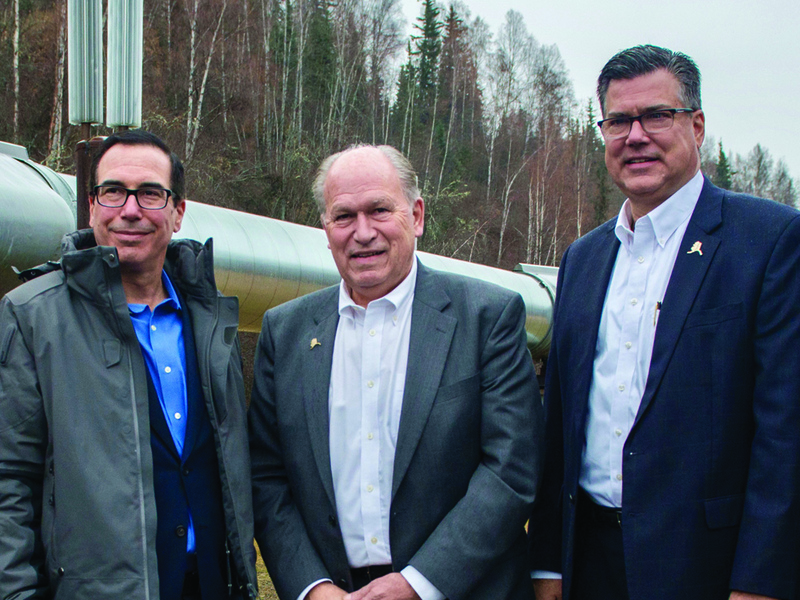 State gasline officials celebrated progress ensuring Alaskans will have first crack at filling the thousands of jobs that could be available to build the $43 billion Alaska LNG Project while at the same time trying to navigate the no man’s land of the U.S.-China trade dispute. The Alaska Gasline Development Corp. announced a framework deal with three construction trade groups Oct. 13 that are expected to lead to project labor agreements for building the three major components of the LNG export plan. The agreement with the Southcentral Alaska Building and Trades, Fairbanks Build and Trades, and the Alaska Petroleum Joint Craft councils sets the groundwork for negotiating project labor agreements, or PLAs, with the large engineering, procurement and construction firms that will manage the project through the construction phase. It sets the terms for work rotation schedules, employment and safety training requirements. Wage schedules for the project will be set based on current rates for public construction contracts when the work begins, according to AGDC. The trade councils are affiliated with the Alaska AFL-CIO, which has endorsed Walker in the upcoming election for governor. “An Alaskans-first agreement guarantees qualified Alaska residents will be first in line to construct and operate the major components of this gasline,” Alaska AFL-CIO President Vince Beltrami said. AGDC estimates the project will generate upwards of 18,000 new jobs in the state over about six years of construction if it is sanctioned. Nearly 12,000 of those jobs will be directly dedicated to the project itself: 1,300 heavy equipment operators; 1,500 pipefitters and welders; 2,300 general laborers; and 3,500 truck drivers to move countless types of materials, modules and construction equipment — not to mention the 807 miles of steel pipe. Hundreds more electricians, carpenters, ironworkers and engineers will also be needed, as well as 1,600 people to feed, house and otherwise support those swinging hammers and welding pipe, according to AGDC. Meanwhile, corporation President Keith Meyer emphasized the ongoing viability of the project in the face of a 10 percent tariff instituted last month by China on U.S. LNG imports during an Oct. 11 board of directors meeting. China originally contemplated a 25 percent tariff on U.S. LNG imports. Nationalized Chinese oil and gas giant Sinopec is a tentative anchor customer for the project after it signed a nonbinding agreement with AGDC to purchase up to 75 percent of Alaska LNG’s expected 20 million tons per year of production capacity in November 2017. That joint development agreement also detailed the prospect of the Bank of China and China Investment Corp. correspondingly financing up to 75 percent of project development costs with a mix of debt and equity. The Chinese consortium and AGDC signed a supplemental agreement Sept. 29 to collectively reaffirm their desire to reach a firm deal by the end of this year, Meyer noted. He said the “trade friction” between Washington and Beijing is creating uncertainty that LNG project developers in other countries see as an opportunity to fill growing Chinese demand for natural gas imports. “This project looks beyond that momentary friction,” Meyer said in an interview, adding that a contingent from the Chinese embassy was recently in Anchorage to discuss Alaska LNG and broader trade opportunities with state officials. “Their message is cooperation not conflict, and we feel that way as well,” he said. Negotiations are progressing; the companies are awaiting government approval on certain deal terms and Sinopec has signed confidentiality agreements with the producer companies in Alaska that provides access to the upstream gas resource data, according to Meyer. He also stressed that the project’s stable gas pricing — AGDC has estimated it can get LNG to Asian ports for $7 to $8 per million British thermal units — is still a very strong selling point for utility customers wanting an alternative to the price volatility of traditional oil-linked LNG contract terms. On the regulatory side, AGDC Vice President of Program Management Frank Richards said he expects the corporation to set a schedule to respond to the latest series of questions and comments from the Federal Energy Regulatory Commission in the next few weeks. On Oct. 2, FERC, which is writing the Alaska LNG environmental impact statement, or EIS, sent AGDC 193 questions and comments, the sixth such data request the agency has issued for the project. Richards said that some of FERC’s requests will have to wait until data can be gathered during the 2019 summer field season and others won’t be needed until the final EIS is being drafted. AGDC has been on a tight budget since taking control of the project in January 2017 and Meyer acknowledged that funding has to some extent impacted the corporation’s ability to answer FERC quickly. “If we had more money to spend we could turn (responses) quicker, but I think we’re turning it adequately,” he said. AGDC has chosen not to request additional funding from the state Legislature over the last two budget cycles while the state was in the midst of multibillion-dollar budget deficits. Instead, since early 2017 the corporation has relied on $102 million left over from prior year gasline appropriations to pull together the $43 billion endeavor. The corporation had $48.6 million remaining as of August and is forecasted to have $12.1 million left at the end of the 2019 state fiscal year in June, according to Finance Manager Philip Sullivan. He said AGDC is under-spending its budget in all areas; actual spending was $247,000 below its operating budget plan for the first two months of fiscal 2019. Its full-year operating budget was approved at $10.3 million. A contributing factor to that is AGDC currently has 20 full-time in-house employees, but it budgeted for 26 employees, Sullivan added. Richards and Meyer also noted that despite the tight funding for advancing the EIS, FERC recently moved the Alaska LNG EIS schedule up a month; the draft EIS is now expected in February 2019, with a final draft coming the following November. Meyer said additional funding would most help with “keeping an aggressive construction schedule on track,” as the industry consensus is that the current global LNG oversupply will evaporate closer to 2022 than the 2024-25 timeframe discussed a couple years ago. Most of the growing demand is coming from China, he said. “Now everybody’s trying to be that project to fill that (supply) gap,” Meyer added. While AGDC has not directly asked for additional funding, the corporation requested authority from the Legislature last session to accept third-party investments. However, the Legislature rejected that request in its final state operating budget. If AGDC could get an injection of more than $100 million, the corporation would be able to complete advanced engineering and schedule long lead time items, such as pipe for the gasline from steel mills that are already busy with orders in the global natural gas boom, Meyer said. That funding would be rewarded with an equity share of the project. “The more money we have the more aggressive we can be,” he said.